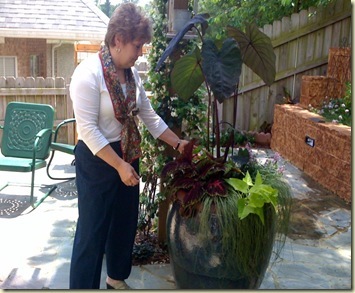 Pam Jones’ diminutive garden will be among those featured in the Starkville Arts Council’s “Art in the Garden” series set for May 16 from 9 – 1 p.m. I went over today to tour the garden and was amazed at what you can do with a few square feet of space and a lot of big ideas. Pam returned to Starkville after being away for much too long. She reclaimed her weekend home and set about injecting a personal statement – not only into the house, but the garden. 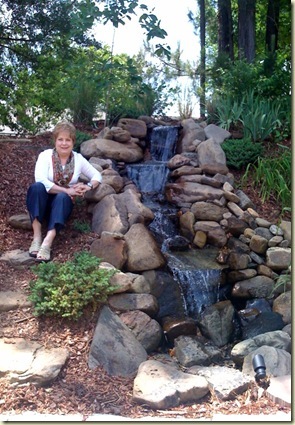 Above, you can see how she turned a steep wisp of a back yard into a place to linger and enjoy nature.When she moved in – during the summer of 2006 – the garden was devoid of any ornamentals, any personality, really. The small back yard was little more than a steep embankment devoid of vegetation. The first thing she did was to replace the barren slope with a decorative retaining wall capped by a drifts of white annuals and vivid Knock-Out roses. She “texturized” the stones by painting it in three different shades of brown to add more interest. 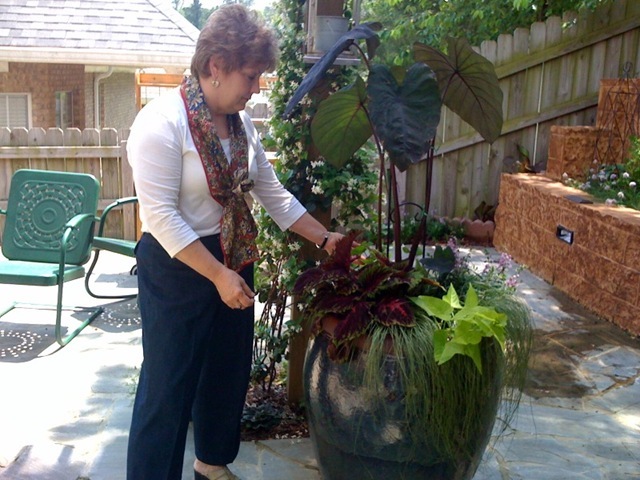 Massive pots, strategically placed, are planted with elephant ears, coleas, and graceful cascading grasses. Pam looks forward to returning home in the afternoon to sit outside and listen to the waterfall or leisurely tend her garden. It has become a colorful and peaceful retreat. Small enough to stay on top of, and large enough not to feel cramped. Perfect. I’m trying to figure out how to do the waterfall. I have a hose and some river rock, but for the life of me I can’t figure out how to make it circulate back up and come down again. This entry was posted in Gardening and tagged Small gardens, Starkville Arts COuncil Art in the Garden, tiny gardens by Emily Jones. Bookmark the permalink. Emily, this is a great article. I love Pam’s garden And sunroom! We’d build one if we weren’t so old! She is very dear to me. I stopped by there last Saturday. I look for your articles every week on Wednesday. Sometimes I get my best laugh of the week. Sometime we need to get together to see if we can get the world straightened out! Hey Dot. Great hearing from you. Haven’t seen you in the longest time. Let’s get Pam and do lunch! Emily…love your site…blog ….and you know how much I love Pam. It is amazing what she has done with that little bit of space. But I always thought she could do anything…..well. Hey Honey – do you still live in Starkvegas? I haven’t seen you forever! Easter piece also. It gets funnier with time!! Sent to my sister. Kathy, I’ll get by to see you at some point. Don’t know the Reads – do I?